A dominant first period couldn’t bolster Tampa Bay’s lackluster second and third periods. The only way to erase narratives is to have your play on the ice say otherwise. For 20 minutes, the Lightning were doing that. Controlling play and shell-shocking the Columbus Blue Jackets en route to a strong start to the playoffs. 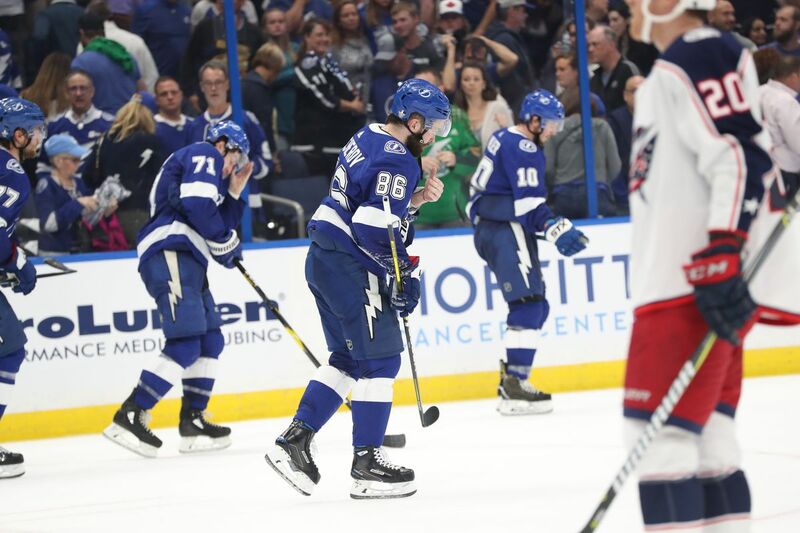 A lackluster two periods ended up sucking the life out of them as the Jackets rallied from a three-goal deficit to beat the Lightning 4-3 and take a 1-0 series lead. The Lightning made season and franchise history this evening as they blew a three-goal lead for the first time all season and for the first time ever in the post season—yes, ever. There was a reason I never thought about making this a four or five game series. Columbus is a good team—flawed, but good. Tampa Bay wasted a fantastic opening period in a game they had little business losing. When Yanni Gourde made it 3-0 in the first period, the Lightning had an 88% chance of victory according to MoneyPuck.com. There’s no way to cover this loss up. It was bad even if you prefer the silver lining that Tampa Bay won the expected goal battle 61% to 39% according to NaturalStatTrick. “We were running all over the place,” was John Tortorella’s thought for the first period. Tampa Bay’s aggression and forecheck caused issues for a Blue Jackets team that had a strong opening few minutes. It wasn’t until a penalty on Dan Girardi for an illegal check to the head that Tampa Bay pounced on an opportunity. Alex Killorn gets the party started with this steal and goal. He manages to get just enough elevation on his backhand to get it past Sergei Bobrovksy and make it 1-0 at 4:12. This was also Tampa Bay’s first shot on goal of the period. Killorn’s goal sprung the Lightning to a period that saw them control 63% of the shot attempts and earn a 71% of the expected goal share. Columbus pushed back at times during the period, but it was Tampa Bay dictating everything. Their pressure forced a few chances, but it wasn’t until 11:01 where Anthony Cirelli scored his first of the playoffs. A strong forecheck from J.T. Miller created a takeaway and a one-timer from Cernak created the rebound. The big thing to pay attention to is how Cirelli gets lost in coverage. At first, David Savard has him covered, but as the puck moves toward the point, Savard gets caught puck watching as Cirelli peels away from him and toward Bobrovsky. After making the initial save, Bobrovsky was left alone to try and fend off Cirelli, who lifted it past the sprawled out goaltender to make it 2-0. A few minutes later, after Columbus had a small moment of pressure, Tampa Bay extended their lead to three with Yanni Gourde’s first of the postseason at 17:50. Great job by Jan Rutta to poke the puck behind Artemi Panarin for Brayden Point to recover and pass right back to him. From there, all Rutta had to do was feed it to a wide open Mikhail Sergachev. Sergachev fired this one on net and it was destined for Bobrovsky’s glove before Gourde managed to deflect it below the mitt and into the net. After this, Columbus’ frustration started to show as they began to get a bit more physical than before. It led to an interference penalty on Savard at 19:27, which gave the Lightning another golden opportunity to extend their lead. Tampa Bay failed to convert during the remaining 32 seconds of the first period but were primed with a power play to start the second. Tampa Bay had two golden opportunities to make it 4-0—both from Nikita Kucherov, but one was thwarted by Bobrovsky showing everyone he’s a multiple Vezina winner for a reason and the other rang off the crossbar. After those chances, the Lightning power play failed to create much of anything and Columbus began to take control. The Blue Jackets are similar to the Lightning in the sense that they forecheck relentlessly when they’re playing their game. It wasn’t as noticeable during the first five minutes of the period but once the Blue Jackets got settled, it got rough for the Lightning. Why Ryan McDonagh tries to force this pass I have no idea—there’s three Blue Jackets near him, just throw it down low or carry it to the point to separate the defenders. Josh Anderson makes the right read on the tip and off to the races goes Nick Foligno. An interesting thing that Columbus kept doing was shooting toward Andrei Vasilevskiy’s blocker side. They were aiming high on that side, and most of their shots were leaning toward that direction. This goal gave Columbus some added momentum and it led them to control 59% of the shot attempts that period. Tampa Bay had the quality edge with an expected goals percentage of 60% but when Bobrovsky does things like this, it’s hard to score. This is how the third period started for Tampa Bay. The opening five minutes was mostly back and forth, but Columbus slowly began to dictate the pace. Tampa Bay did themselves few favors with poor puck management and poor passes. It eventually led to David Savard making Victor Hedman look like a minor leaguer. Wow. Savard coasts in on this one and Vasilevskiy barely moves here. Sometimes you get beat by a good shot, but this could not have been easier for Savard. Hedman wasn’t great this evening and this was just the most flagrant of his mistakes. Two minutes later, Tampa Bay was gifted a four minute power-play when Brandon Dubinsky was called for high-sticking Cedric Paquette. The Lightning did little except give the Blue Jackets even more momentum. Yes, that’s an odd-man rush on the power-play. That should tell you everything you need to know about this sequence of events. Add in Steven Stamkos getting tangled up with Vasilevskiy and this goal just irritates me. It beats Vasilevskiy through the five hole that he can’t close due to his own teammate being in his way. Regardless, Vasilevskiy panicked a bit here, which is understandable, but there has to be some kind of communication from Stamkos to Vasilevskiy here so he doesn’t get completely thrown out of sync. Tampa Bay’s woes would continue when Alex Killorn was penalized with 1:07 left on the power-play. A brief period of four-on-four was played with nothing of note happening, but once Columbus went on the power play, they capitalized. Note, Columbus had the fourth worst power-play in the league during the regular season—let that sink in. Columbus wouldn’t relinquish their lead even as the Lightning scrambled to find the equalizer. There was a chance for Columbus to score on an empty net, but Pierre-Luc Dubois fired it into the hip on J.T. Miller. Thus, after leading 3-0 after one and 3-1 after two, the Lightning fell to the Blue Jackets 4-3 in a game they had little business losing. It’s one thing when score effects take over, but it’s another when a team completely goes off script and tries to outscore their problems and be over aggressive. For reference, Columbus was 2-23-1 when trailing by three goals this season. Tampa Bay was 39-2-2 when leading after two periods. This was a poor way to open the series, but it’s far from over. I’ve rarely seen the Lightning be that dominant in a period this season. They made the Blue Jackets look like they didn’t belong on the same ice as them. Unfortunately, it’s a 60 minute game, not a 20 minute one. Sloppy passing, poor puck management, over aggressive play at the wrong times, failing to win puck battles after dominating that aspect early on - all of these were just pieces as to why Tampa Bay lost tonight. It didn’t help that Bobrovsky played like the elite goaltender that he is, but they had their chances. If they had stuck to their game plan instead of going overboard with the aggression and the over reliance on blind passes, then this game probably doesn’t get out of hand. There’s a reason it’s a seven game series. Losing one game isn’t the end of the world. Tampa Bay is better than Columbus, but that doesn’t mean the Blue Jackets are just going to sit there and not play as hard as they can. They’re the underdog. The Lightning have to fix the issues that plagued them tonight to even the series up or the narrative is going to go into a massive hyperbolic mess of nonsense. The issues aren’t hard to fix or indicative of a greater weakness that Tampa Bay has. It’s just a game that got away from them. This Article has a component height of 70. The sidebar size is long.